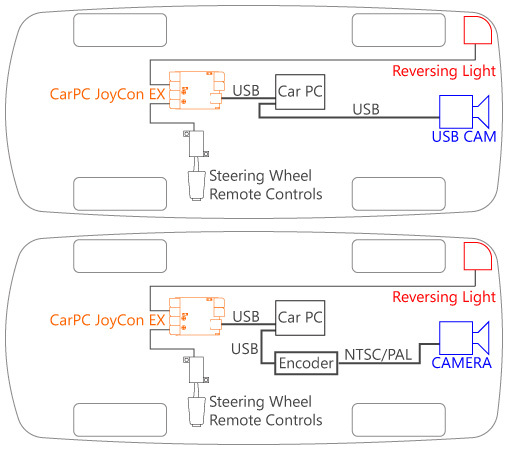 CarPC JoyCon EX converts car steering wheel remote controllers into a PC USB keyboard. 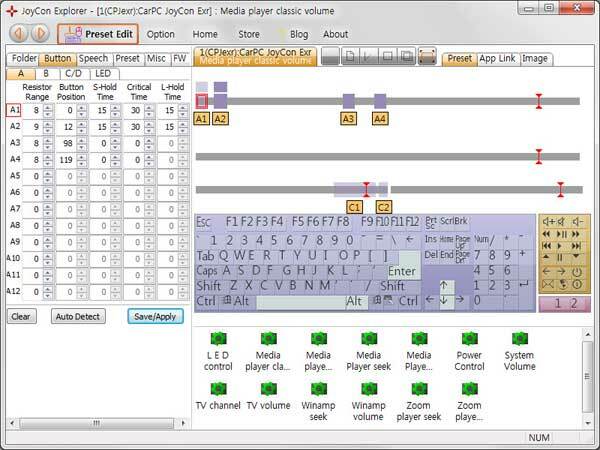 You can control MediaPlayer or front-ends (eg. CentraFuse) with your steering wheel audio remote controller. As the buttons of your steering wheel controller are mapped to PC keys of your choice, you will be able to control any software which can be controlled with PC keys from a keyboard. 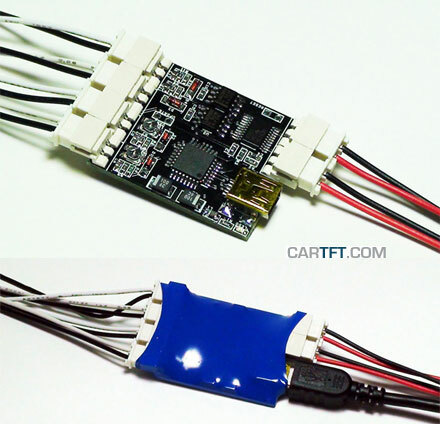 - Works same as standard USB HID keyboard and HID remote controller by hardware. - 24V tolerant 4 channel resistive(voltage) input. - Supports 28 physical buttons, 52 programmable logical buttons. - Long and Short button for one physical button, up to 5 simultaneous key strokes by one button. - 2 programmable LED port. 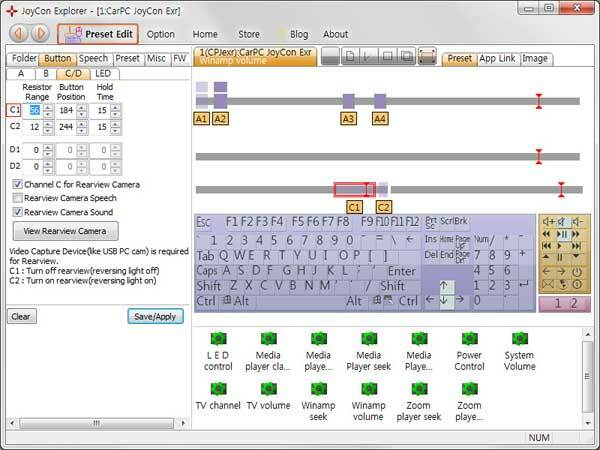 - Remote wake-up(resume PC from sleep with steering wheel remote controls). - Preset change by Preset up and down buttons. - Speech and OSD when preset is changed, when button is pressed. 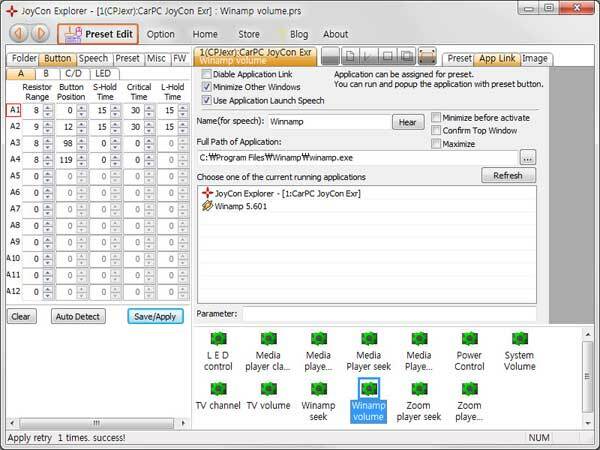 - Application link(application launches and pops up with preset changing). - User definable Button Speech and OSD. - No external power or driver installation needs. App Link enables to launch application with steering wheel remote control's button and switch application when preset is changed. Connect two wires of CarPC JoyCon Exr’s input channel to the remote controls, and connect USB. 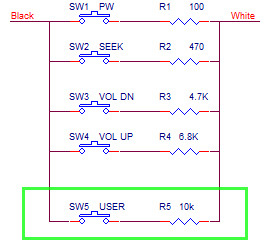 This is the typical resistance-output steering wheel remote controller's circuit. You can put additional buttons like green box below by DIY, if you want. You can control two external LED. You can use typical USB cam as a rearview camera with CarPC JoyCon Exr. Any USB camera or video capture device can be rearview camera. 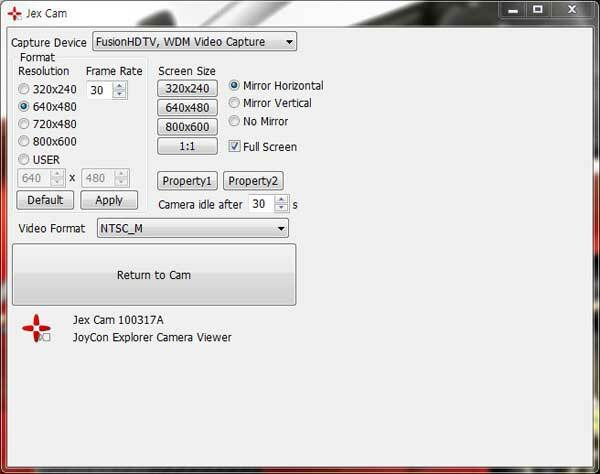 Jex Cam shows when reversing light is detected. Any video capture device can be rearview camera. Horizontal and Vertical Mirror is supported. This video shows rearview test with USB camera. What is different Exr from Ex? Exr is almost same with Ex. Exr can select master/slave mode by software option(at JoyCon Explorer). Master mode is to connect CPJexr to PC only. Slave mode is to connect CPJexr both to PC and Car Radio. In the previous EX version, user had to desolder the diodes on the PCB manually to use slave mode. And Exr has an extension port for future upgrade. Produit performant, installation assez complexe demande une certaine patience mais très pratique une fois installé et paramétré. indispensable pour récupérer ses commandes au volant. Works perfectly with my Suzuki Grand Vitara -13. Il circuito è ben realizzato e funziona che è una meraviglia. Il software deve essere scaricato dal loro sito e non richiede alcune driver per essere installato. Personalmente ho trovato il software, tutto meno che intuitivo. . Nel corredo sono inclusi un po' di cavetti di ricambio, già cablati su micro-connettori, una piccola guida e un paio di guaine termosensibili, utili per proteggere la schedina. Super Sache diese kleine Platine. Gut durchdacht und nach kurzer Zeit einfach bedienbar! Steuert in meinem Mazda 6 Centrafuse ohne Probleme.